Educated Cheese: What do I think? Me (during the 4th inning Smoltzing): ::choice word, choice word, well lots of choice words:: Oh my god, just let him go. Me: I don't care. Away. On Smoltzy...Q: What's the definition of insanity? A: Doing the same thing over and over, and expecting different results. Theo/Tito - WAKE UP!!! 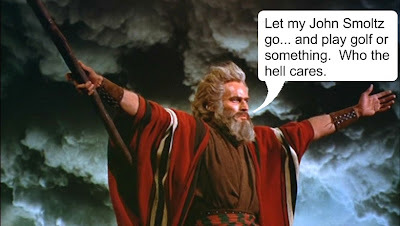 Moses agrees. Hell, Randy Moss agrees. He gets through the lineup once and that's all. Sadly he'll soon be reduced to long relief and mop up duty, shame to end the career like that. I hear ya; it's too bad, but c'mon...deep down we all knew his starting career was OVER! It's better he fade into the bullpen than be murdered some night leaving Fenway Pahk! You can't trust those rabid fans of Red Sox Nation. And I beg to differ on getting through the line-up once.....I think he went through that Yankee line-up 6 times in the 4th!! It's either demoted to bullpen or put on the DL. I smell a new poll, and that's totally not a gay joke at myself or anything. Damnit.